Deal-maker, art collector, philanthropist - the definitive biography. At his death in 1955, Calouste Gulbenkian was the richest man in the world, known as 'Mr Five Percent' for owning 5% of Middle East oil production. For half a century everyone from the Ottoman Sultans to Joseph Stalin sought his advice on oil policy, the latter rewarding him with Rembrandts from Russia's Hermitage Museum. Today the companies that Gulbenkian created - including Shell and Total - are household names, while the international agreements he brokered still shape the fortunes of Iraq, Venezuela and other oil-producing countries across the globe. Yet Gulbenkian's secrecy has ensured that his remarkable story remained untold - until now. Given unprecedented access to Gulbenkian's private papers, Jonathan Conlin pieces together the many lives of a powerful recluse: deal-maker and financier, but also diplomat, art collector and philanthropist, jealous husband and domineering father. This detailed account reveals the effects of Gulbenkian's restless life on those whose interests he sought to serve, as well as on the Foundation which remains his greatest legacy. 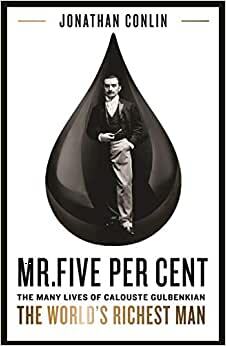 Start reading Mr Five Per Cent on your Kindle in under a minute. Jonathan Conlin was born in New York and studied history at Oxford University, followed by graduate work at the Courtauld Institute and Cambridge. He has taught modern British history at the University of Southampton since 2006. His books include The Nation's Mantelpiece: a history of the National Gallery, Tales of Two Cities: Paris, London and the Making of the Modern City, and a biography of Adam Smith. Historian Jonathan Conlin has unfortunately written a very dull biography, at least to this reader, of Calouste Gulbenkian (1869-1955) who was perhaps the founding father of the Middle Eastern oil industry. Coming from an upper-middle class Armenian trading family in the Ottoman Empire and operating out London and Paris, Gulbenkian became one of the major conductors of the global oil industry orchestra. His friendship with Henri Deterding of Royal Dutch enabled him to meet all of the major players in the industry and helped bring about the merger with Shell. He became known as an “honest broker” and with his knowledge of the region he created what was initially known as the Turkish Petroleum Company which later became Iraq Petroleum. Now get this his partners were Standard Oil of New Jersey/Socony Mobil(now Exxon), Anglo-Iranian Oil (now BP), Compagnie Francaise des Petroles (successor to Deutsche Bank after WWI and now Total) and Royal Dutch/Shell. The four corporate partners each owned 23.75% of Iraq Petroleum and Gulbenkian owned the remaining 5%. Gulbenkian then authored the famous “Red Line Agreement” which along with its “self-denial clause” meant that all the parties to agreement would have to conduct their business through Iraq Petroleum. Inside the Red Line were the yet to be discovered oil fields of Saudi Arabia. Thus with the exception of Kuwait, which was outside of the Red Line, Gulbenkian had a claim on 5% of all of the oil discovered in the Middle East. It made him one of the richest people in the world. Gulbenkian was also involved in oil deals in Venezuela, Mexico, Indonesia and Russia. It is a great story, but somehow it doesn’t leap off the pages. Conlin discusses Gulbenkian’s giant art collection came into being, some of which was directly obtained from Joseph Stalin. His family was highly dysfunctional to say the least and the 1915 Turkish massacre of Armenians did not seem to affect him. He lived in London and Paris where he had large estates, but he slept in luxury hotels. Along the way he held multiple passports which kept him safe for a while in WWII Paris, before moving on to Lisbon. As I said from the outset, there is a great story here, but the writing is too dry for my taste. Unless you are keen on the murky origins of the international oil business, have a special reason to learn about the Gulbenkian family, or would like tips on how not to establish at death a large private foundation, this book may safely be set aside. Professor Conlin has taken a good deal of time and trouble to write this book, but the sad fact is that Calouste Gulbenkian led a life that was not conducive to the biographer's art. Business deals are usually dull in detail and yet Gulbenkian left few other records. Nor did he have friends, such as Boswell to Johnson, to take witty and interesting statements and stories down. Even his art collecting was private. He was rich, now he is dead. This masterpiece is neither 'dry or dull' as an earlier reviewer described. The biography is a sophisticated analysis of the oil industry and the contracts involved that Mr Gulbenkian negotiated. The research is superb and the writing is exquisite. In fact i was able to improve my vocabulary quite a bit. Looked up in my dictionary rastaquouere, calumniated, escudo, langorous, unpunctuated, pantechnion, divertissement, bibelot, nymph, lickspittle, velodrome, castellation, obsidian, tractarian and sprezzatura. The research is meticulous. To gather so much information about a mysterious and extremely secretive man must have involved loads of time-consuming travelling and online research. One gets a genuine feeling of the countries involved during that historical time, and the life-styles of the fabulously rich, and the relationships between business partners plus family and of course the international oil business. I recommend this most fascinating and well written book. Jonathan Conlin does a good job in bringing Calouste Gulbenkian and his accomplishments out of the shadows that he relished. Mr. Gulbenkian did everything in his own way in his professional and private life as well as within the Armenian community, as if no rules were applicable to him. Mr. Five Per Cent was a gifted, relentless, and paranoid negotiator and networker with a clear focus on the orderly development and consolidation of the fragmented, fast-globalizing oil industry through vertical integration and international cartels. Mr. Gulbenkian ‘love-hate’ professional and personal relationship with Henri Deterding of Royal Dutch-Shell laid the foundation of his fabulous wealth. To his great credit, Mr. Five Per Cent successfully kept his place and earnings in the international cartels that he helped create, despite the best efforts of Big Oil to kick him out of these arrangements. This achievement was remarkable because Mr. Gulbenkian was neither an oil man nor a man with any special, oriental expertise. Furthermore, Mr. Five Per Cent’s dysfunctional family life was as byzantine as his business dealings. He was neither a good husband nor a good father. In addition, Mr. Gulbenkian showed a similar detachment in his art dealings and philanthropy. For example, he did not mind too much to be far way from his art collections for years in a row. Surprisingly, Mr. Five Per Cent did not apply his cardinal rule of ‘check, check, check’ when it came to the creation and management of the Calouste Gulbenkian Foundation in Portugal. His poor, deteriorating health at the end of his life in the 1950s could explain his ‘philosophical’ stance on that subject. To this day, the Foundation manages a €3 billion asset portfolio, which includes among other things Mr. Gulbenkian’s art collections and Partex Oil and Gas.